It has been over a year since my last posting. I have been visiting blogs, reading and sometimes commenting on others’ posts. I have missed the interactions with my friends here, but my life has been very full and busy. Last year at this time, I was knee deep in settling the modest business affairs of my parents’ estate, and chairing the meetings of my group, the Pointless Sisters Art Quilt Group. My quilting life has continued to expand. Some weeks, I actually spend as much time in my studio as I feel is necessary. There have been some definite quilting highlights in the past year, which I will probably mention eventually, but the real delight has been to become involved in a group of amazing women whose energy and enthusiasm have been such an inspiration! I sold my first two quilts last June. Pointless Sisters had a show at the Finley Center in Santa Rosa, where I exhibited several of my small art quilts. We were able to offer our pieces for sale, but the fact that a couple of mine sold was a complete surprise to me. The first one was to a member of my group, who bought my Sky Father quilt. The second was to a couple I have never met, who purchased Abbott’s Lagoon, to hang in an Air BnB lodging in Santa Rosa. And I displayed 25 of my Made on Monday pieces at our Fall show at Occidental Center for the Arts, and sold 17 of them! It was an odd experience selling these pieces. Each one was made in response to a place I’d been, from photos I took there, in company of others dear to me, and with memories and associations that were very personal. I am having to think about what it means to me to sell the proceeds of my feelings and memories. But, it is very gratifying to know that others value and will enjoy them. I’ve found there are some pieces that I am not ready to part with yet, and some I know that I will never sell. On the other hand, I seem to continue making quilts and I have only a small house. My beauties do not deserve to live life in a closet! A lot of places that Pointless Sisters will show in want us to show quilts that are for sale, because the commissions they get help support their programs. And most of these are programs and causes I am happy to support. But this means that now I sometimes will think about potentially selling a piece, even while I am making it. Will this affect how I work? And, how to put a price put upon my creations? I would love to hear your comments on this. My Summer’s End Quilt is my favorite one, so far, and I have hung it at the head of my kitchen table. It is cheerful and sad at the same time. This quilt and another that I made last summer were included in an exhibit of the Northern California Quilt Council, New Quilts of Northern California 2017, at the Pacific International Quilt Festival in Santa Clara last October. It was the first time I had attended that show, and it was so much fun to have my own work there! A number of the Pointless Sisters had quilts exhibited at PIQF, and a group of us attended and spent a couple of days there. The second quilt I entered in this exhibit is called Swamp Thing. It was made in response to a group challenge to use fabrics that were provided by the husband of a quilter friend of several of our group. The fabrics were very random in style and type, but I chose some scraps of interesting fabrics, mostly ‘home decor’ category, upholstery, drapery, etc., in a color palette that appealed to me, and created this fused collage. I’ll roll out a few others that have been made over the past year. But I wanted to check in and say hello, and thank you for following and for your patience during the long hiatus. Glad to be back with you all! In my last post, a Sentimental Journey, I filled you in on what’s been happening in my life the past few months. I had sketched a pretty good (for me) version of a wilting sunflower, and had an idea how to translate it into fabric. Once home, I decided to do an improv-pieced background and place my sunflower image on top of it. It turns out that the background I came up with was, actually, composed of two different improv ‘blocks’. For the upper part of the background, the ‘sky’ I used strip piecing similar to a couple of earlier projects. I hand cut strips in a more or less consistent width, then stitch them end to end, in a fairly random order, then cut them into lengths equal to the width of the piece I need, then stitch them together side by side. For this project I used a variety of commercial fabrics, including some textural prints, and ginghams and shirting plaids, all in shades of blue. For the “ground”, I put together some Sujata-Shah-style stack-and-cut strips of wedge shapes, also using different textures and shirting plaids, this time in brown and gold colors. They represent a late-summer field of dried grass, or corn stalks. Here is a progress photo of the background piecing. I sandwiched and quilted the background first, using a few different variegated Sulky threads, in golds, yellows, browns and greens, using a walking foot. Then, I made a cartoon of my sunflower sketch, enlarged to fit the size of the piece (20″ by 30″) and cut out all the pieces from several hand-dyed fabrics and batiks. These were fused in place, edge-stitched, and embellished with more stitching, some free-motion, some not, in stages building from the background of the image to the front. The last step was to enhance some of the shapes with shadowing. For this I used Derwent Inktense® pencils and a fine-tipped ‘water brush’ to control the amount of water and prevent it spreading beyond the edges where I wanted it to be. I used facings rather than bindings on the edges, which has become my preferred mode for these little art quilts. It makes a nice, clean edge that hangs flat to the wall. One disappointment with the finished piece is that although the stitches do not, the lines of the quilting showed through the applique a bit. This is especially noticeable in the photo, though it is not so much in person. But I am generally pleased with the finished piece. Even though technically, summer has just begun, here is Summer’s End, all done and ready to share. Linking up with AHIQ over at Ann’s and Kaja’s. I see that my last blog post was on March 28, when I posted about the (non) progress of my original “Coin Toss” piecing, and a spinoff of another piece I am working on which I was not ready to share. Around this time, my private life took a bit of a detour, and I took an enforced break from which I am only now returning. But I had been excited about the AHIQ challenge this year, and encouraged by the collegial nature of the group of quilters who are part of it, especially by Ann and Kaja. I have been lurking online, reading all the posts, following your progress, and making the occasional comment. Finally, I am ready to share. On May 10, 2017, I lost my dear mother, my biggest fan, and my best friend. Mom was my most faithful reader. She followed my blog from Day #1, and never failed to read my posts and comment on them, privately, to me, in e-mails or in one of our frequent phone calls. She loved everything I ever made. Here is a picture of her smiling at my camera, on a sunny day in 2015, when I took her for a drive up to the top of Mt. Tamalpais. The little quilt of Mt. Tam (my very first art quilt and the banner on my blog) hung on the wall in her apartment, where she could see it every day from her favorite perch on the sofa. It represented the view from our front room when I was young. It now hangs once again in my studio. I was privileged to be able to spend the last several weeks living with her. She had enjoyed a very full, and happy life, and was very independent. When she finally decided to ask for our help, there was not much for my two brothers and I to do but just be with her. There was no real illness, only age and weakness. She was mentally present and articulate about being grateful for what she had had, and also about being ready to go when God called her. Her passing was graceful, accepting and peaceful, and her children were with her. One can only hope to come to such an end. We whom she left behind will miss her every day. Earlier in the year, my art quilting group had set a couple of challenges for the membership. The first challenge was “Flowers” and was due in June. I was not excited about making a quilt with a flower theme, but during the time I was staying with Mom, while going through things in the apartment, I came across my Dad’s stash of art supplies. There was a sketchbook, and some oil pastels. I decided to play with them one evening and made a sketch/drawing of an idea I’d had in my head of wilting flowers. I thought about Mom, also wilting, and what kind of flower she would have been. I decided on a sunflower, for several reasons. She was my Mom, thus larger than life to me; she was born at the end of August, in the hot days at the end of summer; and she was a blonde, all the time I was growing up. So I made a sketch of a sunflower, past her prime, in a simmering-hot summer sun. My drawing abilities are not great, but I was pleased with this sketch. I decided it might be a suitable subject for a small art quilt. I will leave you with the sketch I made, but I will be back for AHIQ to share the quilt that came from it. I didn’t mean to bait and switch, but to be honest, the Coin Toss I posted last month is still in pieces, in a basket, waiting for my return. This happens to me…I got bored with it, and haven’t had the urge to return and finish. I think I’ll probably put it together in the format shown at left. I like the nine patch grid. I like the threes of everything. I still haven’t decided on a fabric for the background. I the black that I used in the photoshop image, for its graphic quality, but solid black would not work with the shot cottons that make up the rest. I’ll have to go stash-diving, and I am sure that something will come to my attention when the time is right. However, this does not mean I haven’t been working on anything, when time permits, or that I have abandoned improvisational work. In fact, I keep re-discovering how much I like working this way. Whatever you want to call it, improv, intuitive piecing, liberated piecing, it is a way of working that I really enjoy. I enjoy sitting down with some materials to see what I could make of them; and, that is exactly what improvisation is. In my art quilt group, Pointless Sisters, we voted on the theme for our next challenge. We got three choices each out of about a dozen. None of my three top picks were the winners. I voted for Boxes, Architecture and something else I can’t recall. The winners were Flowers and Reflections. Flowers will be due in June. There are no restrictions as to size, medium, colors, or anything else. I’m not inspired yet, but no worries, I will cook up some sassy abstract interpretation of a flower, and have something to show. But I started to think, if I am not inspired by the Coin Toss quilt, and not by the Flower theme, what do I want to do? And I thought about an recurring idea I had been kicking around for a long time. It involves layers, applique and decorative stitching, and more embellishment, and it required me to use my favorite colors. If you’ve been paying attention, you know that’s all of them. I’ll call it the “mother quilt” for now, though she has a name. The original project generated a lot of strips and smaller scraps, and I was really liking all these colors and patterns together, so I started piecing with the scraps, first thinking they could be the back of the “mother quilt”. By about the second day I looked at what I had hanging on the wall and realized this was a whole new quilt top and much too complicated to be the back of anything. The smaller strips were all about the same length, between 5-7″ and these turned themselves into some chinese coins sets right away. I started piecing around a leftover square from the original, that hadn’t quite made the final cut, and started building an off-set, log-cabin, medallion style, alternating coins with longer strips, and the piece has now grown to about 45″ square. I plan to add additional rounds to bring it to 54″ x 54″ to match the size of the “mother quilt”. Maybe it is a series! 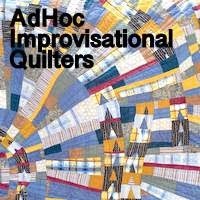 Linking up with Ad Hoc Improv Quilters at Ann’s and Kaja’s. Coin Toss – AHIQ Linkup Better Late than Never! Well I’ve been a bit derelict on the blogging, but it is because I have been working on my online course with Pixeladies in Photoshop Elements, and working on a new project that is completely different to the chinese coins, on which I will comment another time. Also, as it happens, my art quilt group (of which I am now in charge of running the meetings, since last October) happens to meet on the fourth Tuesday of each month, the same day as Ann and Kaja post the AHIQ linkup. So with that and other things, it got to be a busy week. But I enjoy the AHIQ challenge, and the community it has created, so I didn’t want to let the month go by without reporting progress. I have not touched the actual piecing I did when I last posted my Chinese coins, but I have used it as a learning tool to see how Photoshop Elements can help me work out quilt designs. I guess that takes it a little bit out of the improv world but it is an alternative way of auditioning changes, layout choices, color schemes and so on, that I have found helpful. So, by arranging, rearranging and generally fiddling around with my quilt pieces on the computer, I have come up with a layout, and decided that I need a darker, contrasting field to set the pieces in, for this quilt. I am posting this planned layout, on a black background. Now I need to search in the stash for the right background fabric that will serve as the sashing (where the black is) because it is obvious to me that stark black isn’t what is required. I’m enjoying reading everyone’s posts this month and very flattered that my goading of KL Rollag bore some fruit. She has been a regular on the Improv Handbook FB page for awhile and I admire her work, and her pluck! I love that I have developed a web of communication that reaches around the globe. I wish we could all get together for a cup of tea some day, and a good yack! Here’s my chosen layout for the Coin Toss. Linking up with AHIQ, this Fourth day of March, Two Thousand and Seventeen. This morning, the sun is shining in Sonoma County for the first time in a number of days. It has been a long beginning of the year here, with lots and lots of rain, wind, trees down, power outages, mudslides, potholes, road closures and flooding, after several drought years during which we all forgot that these things happen. It will be nice to dry out a bit. Perhaps we will get in a hike tomorrow, while the sun still shines! With my morning coffee, I enjoyed Ann’s post about the beginnings of her Chinese Coins project. I’ve also gotten started on the AHIQ challenge involving Chinese Coins. In keeping with my promise to myself to limit myself to only materials on hand, I chose a set of various colored shot cottons I’ve had sitting around for awhile now. This fabric is quite a bit lighter weight than most of the quilting cottons I have been working with, and it occurred to me it would be a good material to use for some hand-quilting practice, so that is part of the present plan. I find myself in need of a “slow sewing” project. I started thinking about stacks of coins, and how in traditional Chinese or Roman Coins quilts the stacks are very regular and straight, and the coins usually of a uniform size. But this is AHIQ, and I imagined my stacks as sort of irregular and wobbly. I chose five colors for the coins, and found I had plenty of the sort of gray-beige neutral (I think it was called “mushroom”) to use for the background/negative space relief. First off, I made some wide strip sets, each with a color in the middle and background on the sides, and cross-cut them to make the individual coins. I eyeballed the measurements, so the coins would be variable in size. I sorted all the strips into three piles of equal numbers of strips, trying to distribute the colors fairly evenly. Then I stitched them together more or less randomly into three stacks. I say more or less, because I did not allow two adjacent coins to be the same color, and I began and ended each stack with colors different from each of the others. While I was sewing them together, I kept thinking about actual Chinese coins and how I always liked the shape of them. I have some on top of an old sewing basket that I’ve had since the 1970s. When the wobbly coin stacks were done, I proceeded to make three blocks with this coin shape. These are fused applique, with the edges turned under. I would like to add some Chinese characters like the ones on my actual coins, and am thinking how I might do that. Now, these three coins made my thoughts turn to all the meanings of coins; coin toss to decide a question; three coins in the fountain; small change; changes. This led me to thinking how three coins are thrown to generate the hexagrams of the iChing oracle. I formulated a question and threw three coins, three times, resulting in the three hexagrams, and made a block representing each of these. This is where I came to a stop, and turned to another project that was needing to be done. All these parts are hanging on my wall, where I see them every day, and I am waiting for them to tell me how they want to be arranged.